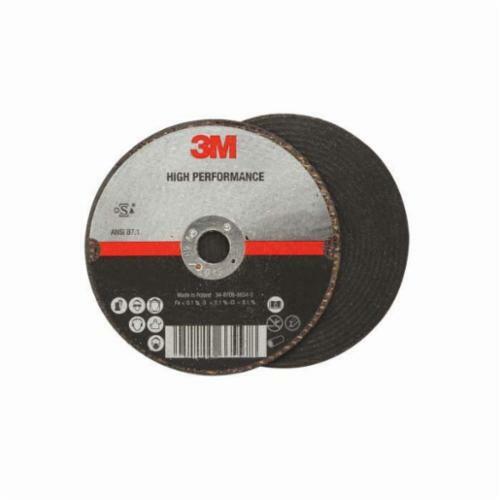 3M™ High Performance Cut-Off Wheel features 3M™ Ceramic Abrasive Grain for high quality, fast cut and increased productivity and throughput. The specially-formulated ceramic grain cuts cool, which makes it a good match for heat-sensitive metals like stainless and mild steel. 3M™ High Performance Cut-Off Wheels are available in a few variations, including Type 1 wheels and Type 27 wheels. Type 1 wheels are straight wheels, whereas Type 27 wheels have a depressed center. When used with abrasive tools and grinding guards, the Type 1 grinding guard has a closed face and the Type 27 grinding guard has an open face. Moreover, the Type 27 wheel is available with a Quick Change attachment system, which makes for easy swapping of discs during a sequence. Type 1 wheels are typically used vertically; an example would be cutting table edges. Conversely, Type 27 wheels are often used horizontally for flush-cut applications. Applicable in many industries, 3M™ High Performance Cut-Off Wheels are used on turbine engines, metal implants, plumbing fixtures, builders hardware, medical instruments and metal fabricated parts. For optimal performance, we recommend using these wheels with 3M™ Cut-Off Wheel Tools (sold separately). Given their thin widths, 3M™ High Performance Cut-Off Wheels cut quickly. Less material slicing through the substrate equates to a faster cut, so it's a good choice when rapid cutting action is desirable.